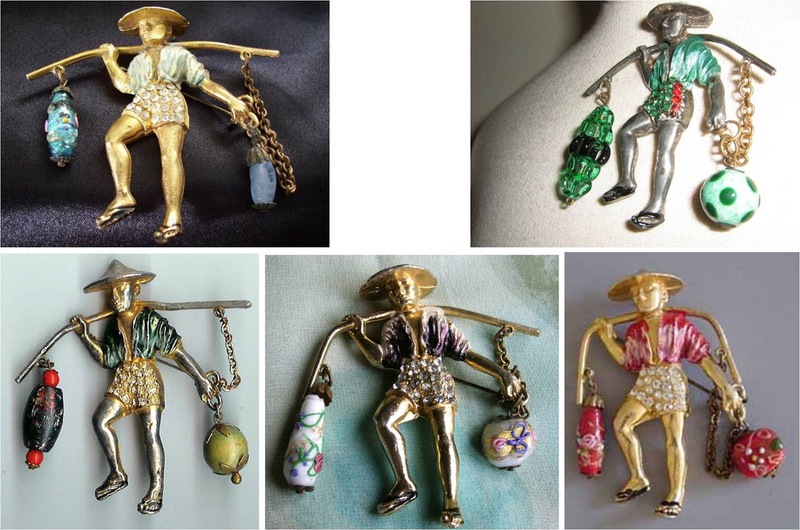 Most costume jewelry collectors have encountered the famous water carrier brooch patented in 1941 by Louis C. Mark, head designer for the Rice-Weiner jewelry company during the early 1940s. 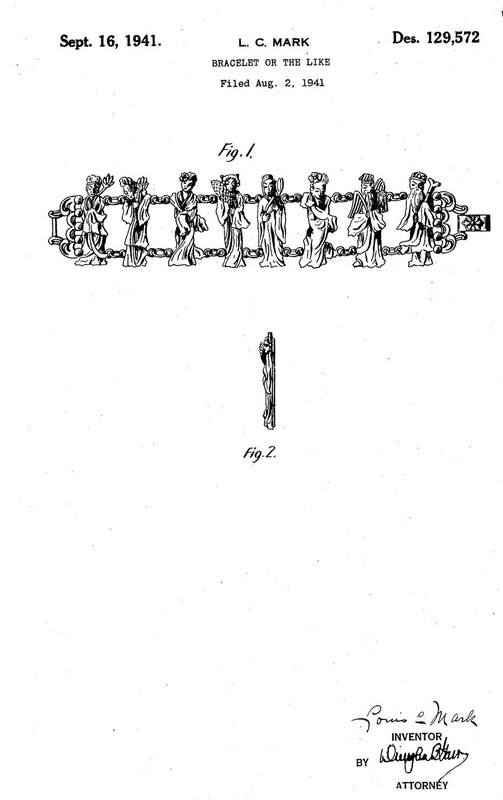 Mark also patented a Chinese-themed bracelet. Has anyone ever seen an actual produced example of this? 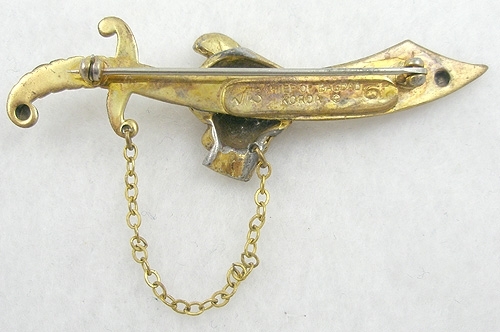 Another famous patented Mark design is the eagle brooch from 1940. 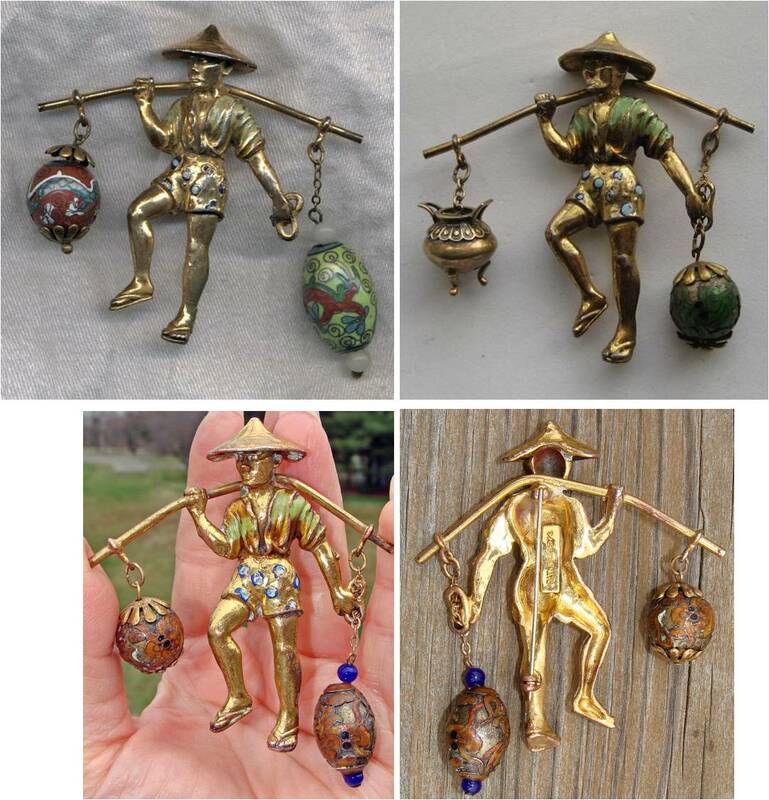 …in the period under review, Rice-Weiner was an important firm, which, particularly in the years between 1938 and 1950 manufactured premium jewelry, which was famous for the quality of its design, materials, and manufacture. The first design patented on behalf of Rice-Weiner by Louis C. Mark of Providence, the firm’s head designer, was an American eagle in fighting stance, dated 13th August 1940. … In September of the following year Mark designed and partly patented brooches, necklaces, bracelets and earrings inspired, according to “Women’s Wear Daily” of 7th July 1941, by Byzantine, Moorish, and Persian motifs (the latter bear the trademark PERSIAN CRAFT accompanied by signs that could be Persian alphabet letters), as well as Etruscan … Maya … and Chinese motifs. What seems relevant here is the penchant for use of non-English letters in the trademark stamps. 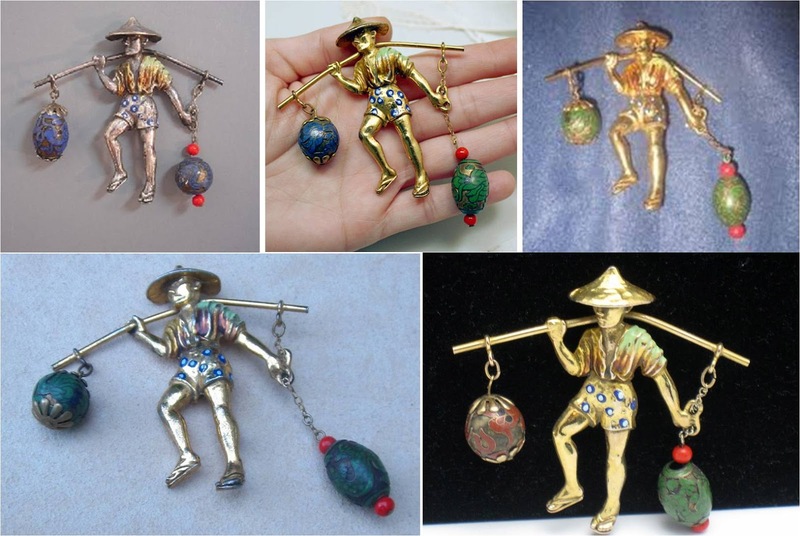 The water carrier brooch appears in two main variations. 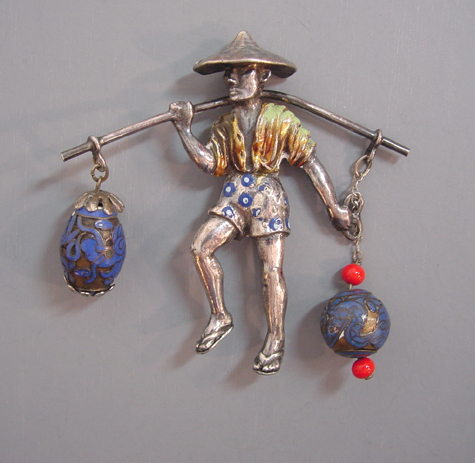 The first version closely matches the patent drawing, with enamel dots on the man’s shorts and Chinese cloisonné beads. The pin is positioned vertically. 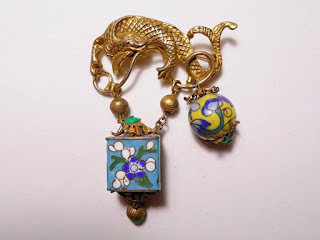 A second version features rhinestones instead of enamel dots on the shorts, and Venetian lampwork beads, pressed glass, or wood beads. 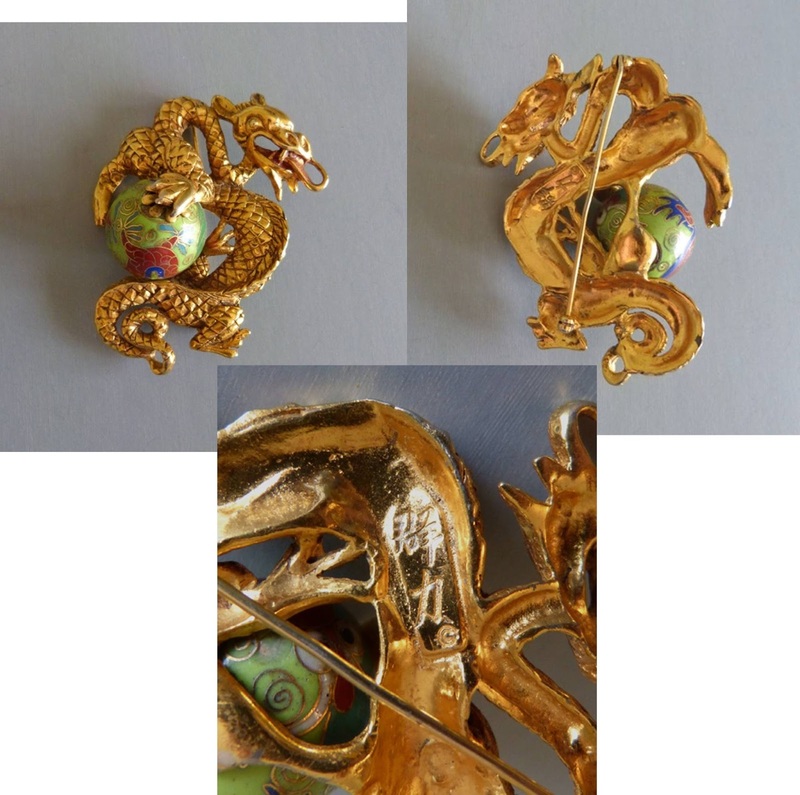 The pin is positioned diagonally. As shown above, the cloisonné bead versions display either of two marks - one with the patent number, and the other with a mysterious pair of Chinese characters. One of the posters at beadcollector.net kindly identified these characters as Qun Li, translating roughly as “group-herd-flock strength,” pronounced approximately as “joon lee.” (An older transcription might appear as Ch'un Lee - I'm not up to speed in this area, however, so don't accept that without question.) The fact that it is accompanied by a © copyright symbol makes it seem unlikely to be a non-US. mark – who except a U.S. manufacturer would care about a U.S. copyright? I wondered if there was someone named June or Julie or Lee among Louis Mark’s relatives and acquaintances. Perhaps those literate in Arabic can examine those other Rice-Weiner marks and determine if they have any assonance or other similarity to the Qun Li characters. The rhinestone pieces lack any identifying mark. While the Brunialti book features a photograph of a rhinestone water carrier brooch, I think the evidence indicates that this was a later version produced 1) when the original supply of Chinese cloisonné beads ran out and could not be restocked (trade interruption due to World War II, Chinese civil war? ), or 2) as a design variant or copy, or 3) both. Louis Mark left Rice-Weiner in 1946, formed the Barclay Company, and died in 1954. The travails of the Barclay Company and the 1950s costume jewelry trade can be sampled in this legal document. 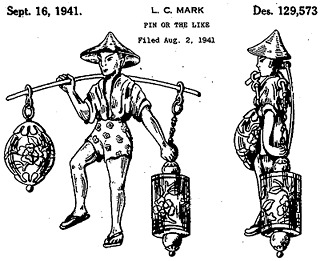 Mark’s patented designs for Rice-Weiner featuring Oriental motifs seem relevant, as the Qun Li mark appears on other brooches. Notice how these are all very large pieces. 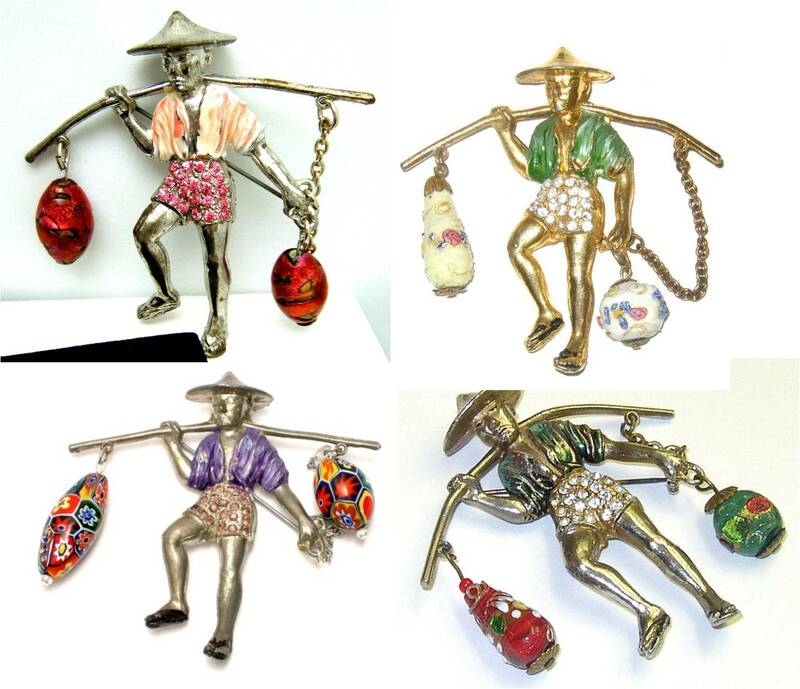 These strike me as a Westerner’s impression of Oriental motifs, not something produced by an actual Oriental designer. 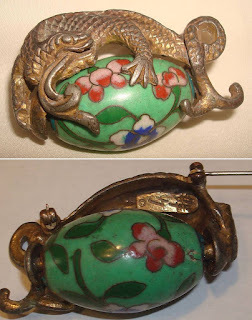 The cloisonné beads used, however, are distinctly Chinese. 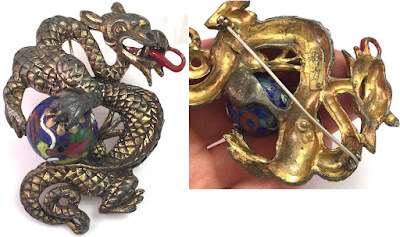 Those who have waded through my previous post onMiriam Haskell will have noticed the similar variety of Chinese cloisonné dragon and floral motif beads appearing in those pieces, which seem to date from the late 1930s-early 1940s. 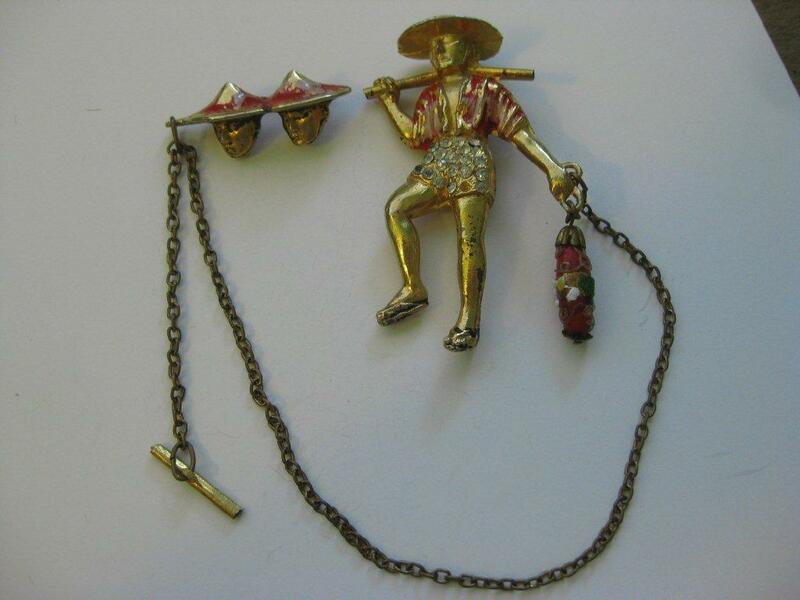 I’ve been unable to find any rhinestone versions of the water carrier brooch that feature the Qun Li mark. While Louis Mark may have used Qun Li for his own mysterious reasons when he worked for Rice-Weiner, it seems unlikely he used the mark when he worked for the Barclay Company. 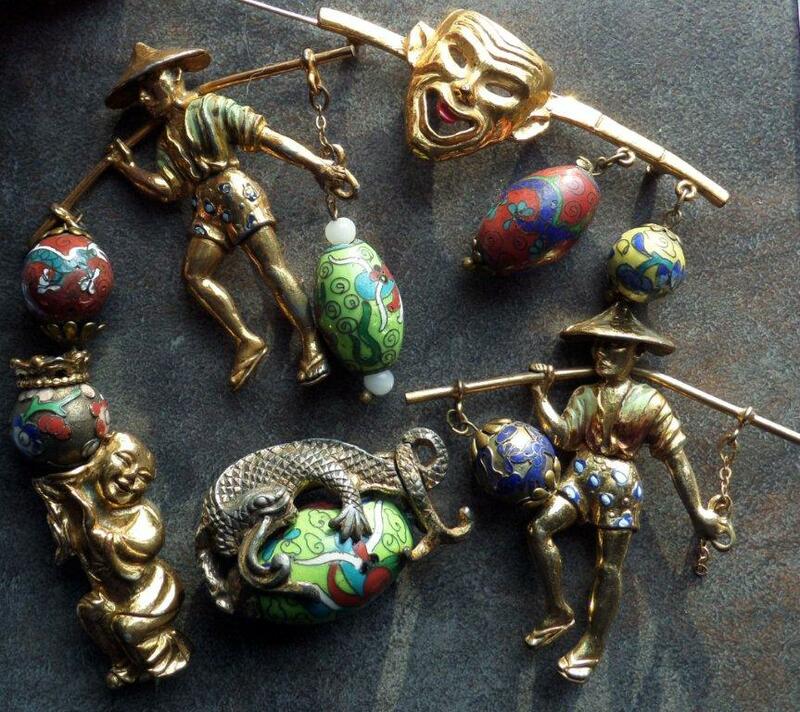 The company was formed in 1946, and the supply of Chinese cloisonné beads had likely run out by then. World War II was over, the Dior New Look was in the wings for 1947, and big early-40s brooches were falling out of fashion. 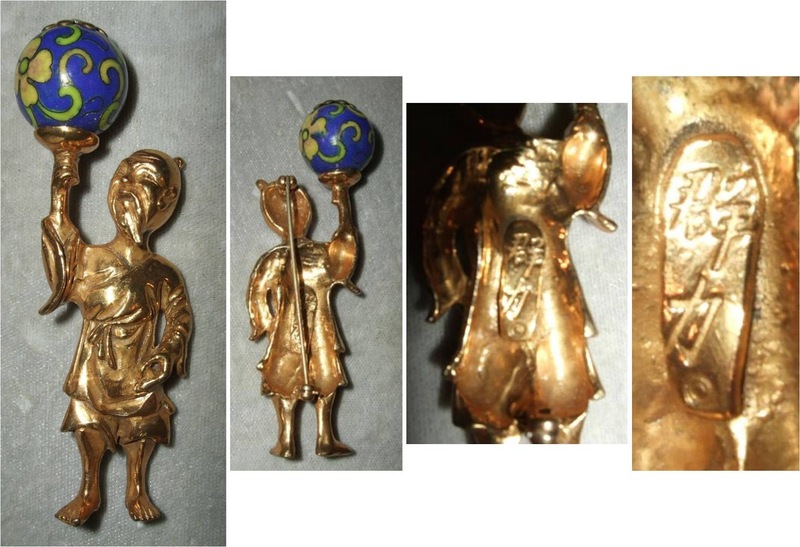 eBay seller wondollar found another vintage brooch that is likely a Rice-Weiner piece. The size of the bead is about 1".